Kansai and Osaka Cherry Blossoms Spots and Sakura Festivals to Feel the Spring! Spring is finally here! In Japan, many people enjoy seeing beautiful Sakura at an event which we call “Hanami”. In this article, I would like to introduce the best Osaka cherry blossoms spots to enjoy Sakura at its best! Also, I would like to introduce some famous Sakura spots around the Kansai area (around Osaka)! If you’re planning to visit Osaka this spring, please check it out! -What is the Weather in Japan in Spring? -What to Bring to Enjoy Hanami Party? 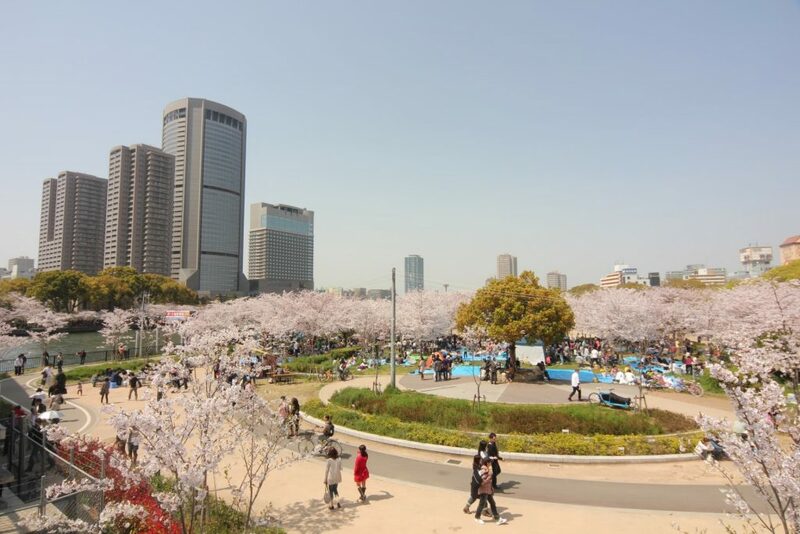 Hanami is an event where people enjoy watching cherry blossoms. Japanese people usually have food and drinks while looking at the blooming cherry trees, like a picnic. This event is very popular in Japan during spring because cherry blossoms, which Japanese call ‘Sakura’, are in full bloom and this event has long and traditional roots. Osaka is the tourist hot-spot of Western Japan. 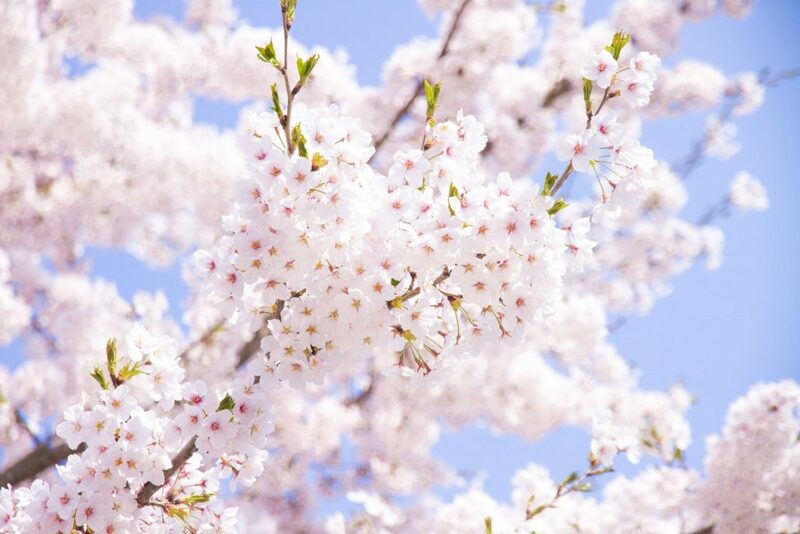 The best time to see the cherry blossoms is around the end of March or the beginning of April. 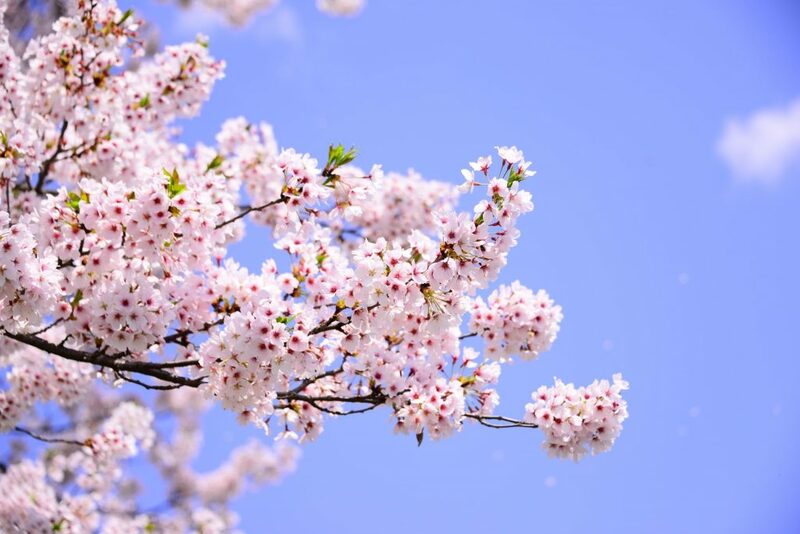 If you want to see the beautiful Sakura yourself, look at this article and pick your to-be favorite place for Hanami in Osaka! Kawasaki Bridge is one of the famous Hanami spots in Osaka, and many tourists visit it to relax and enjoy seeing beautiful blooming cherry trees every spring! 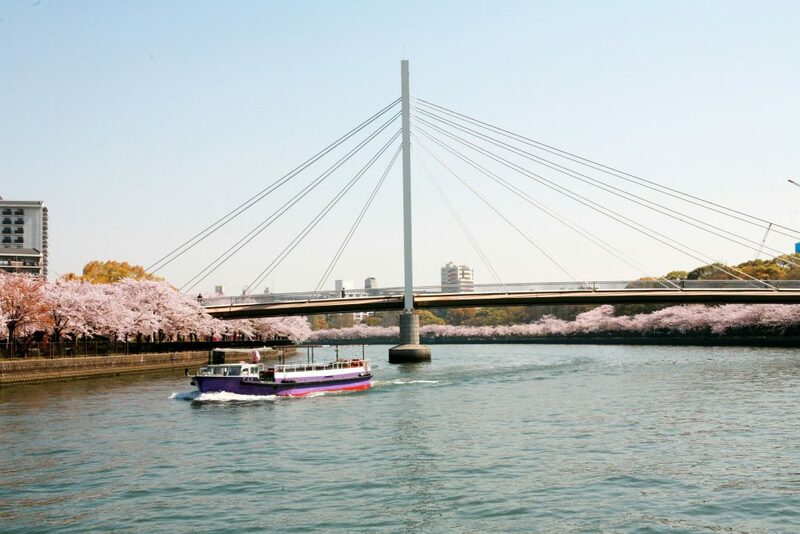 It is a great place to see the lovely scenery of Kawasaki bridge, cherry blossoms, and Okawa river at the same time! 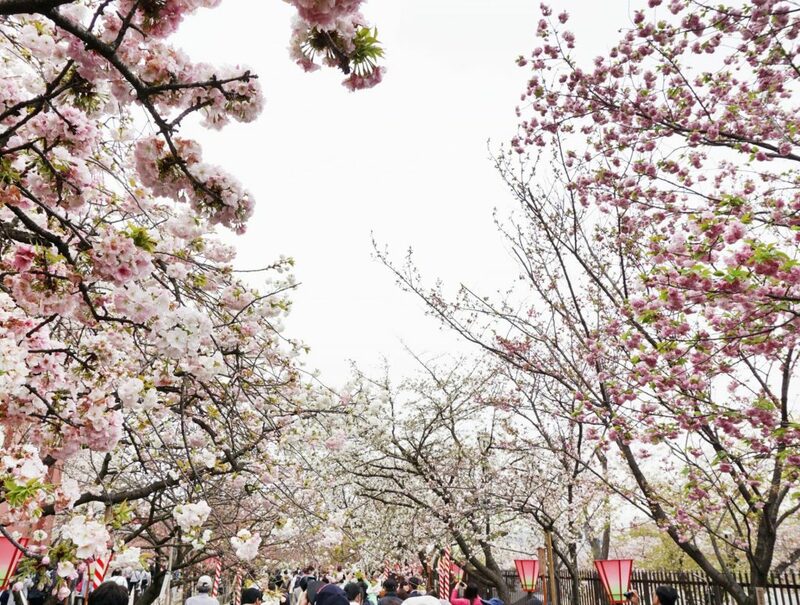 Around the river, there are various food and drink stalls, so get something there and admire the Sakura and the view on the bridge with other Japanese who came to Hanami. If you want to know more about it, please check the article below. Kema Sakuranomiya Park is a river park that lies on the benches of Okawa river and uses a riverbed from Keumaarai to Tenman rivers. 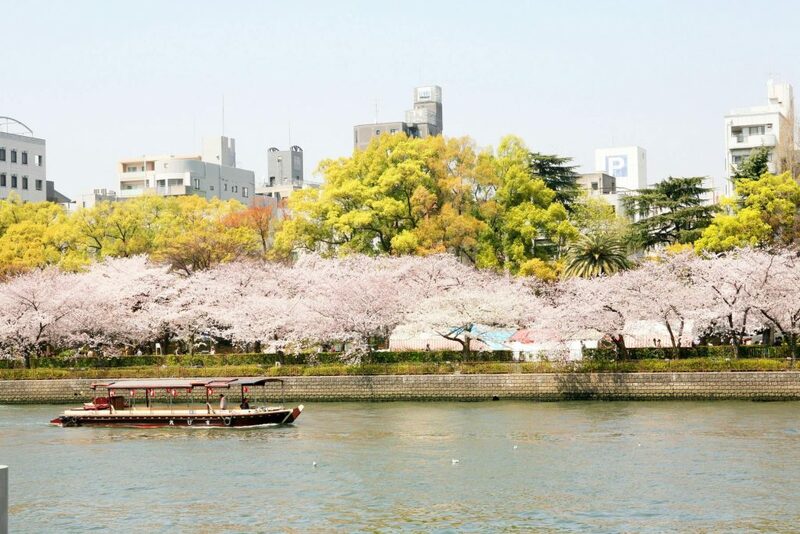 It is famous for one of the popular Hanami spots where you can enjoy seeing a beautiful view of cherry blossoms and the river at the same time! About 4,700 cherry trees cover the river banks in pastel pink every spring. If you want to know more about it, please check the article below. 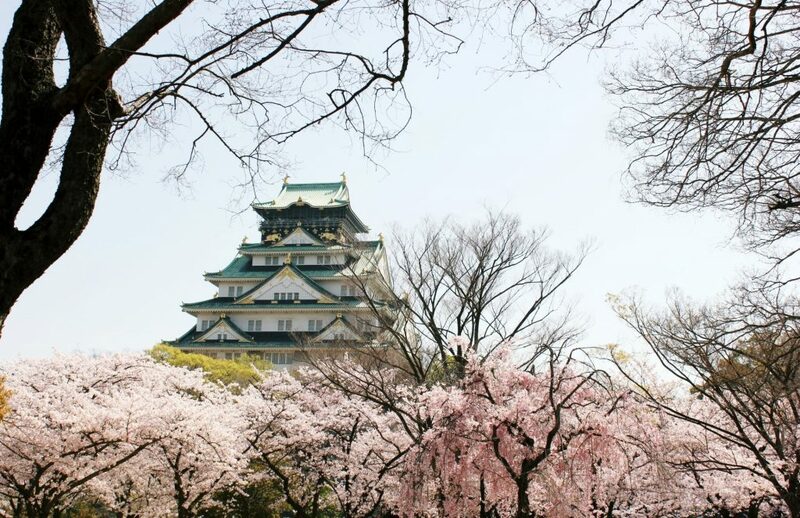 Osaka Castle Park is a famous tourist spot in Osaka, and also it is famous as a popular Hanami spot! You can see 3,000 cherry trees in the Nishinomaru garden which is the best and the most popular cherry blossoms area in the castle. During the Hanami season, this garden opens until late, so you can enjoy the view of the castle at night! If you love taking photos, don’t forget to bring your camera! If you want to know more about it, please check the article below. Access: There are many ways to access to Osaka Castle. There are many famous Hanami spots around Osaka, but the Osaka Mint Bureau is one of the most popular ones in spring every year. You can see more than 350 cherry trees of about 130 varieties. Here you will witness rare species, especially the flower called “Yaezakura”! Compared to “Someiyoshino” (famous cherry tree species in Japan), the start of “Yaezakura” bloom is one week later. So, the best time to visit will be around mid of April. If you want to know more about it, please check the article below. Access: 15 minutes’ walk from Tenmabashi Station on the Tanimachi line or Keihan line. The Expo `70 Commemorative Park is the place where the Japan World Exposition took place in 1970. You will notice a tall statue – the Tower of the Sun which is the symbol of the Japan World Exposition and Osaka. Taro Okamoto, a famous Japanese artist, is the creator of this piece of art. 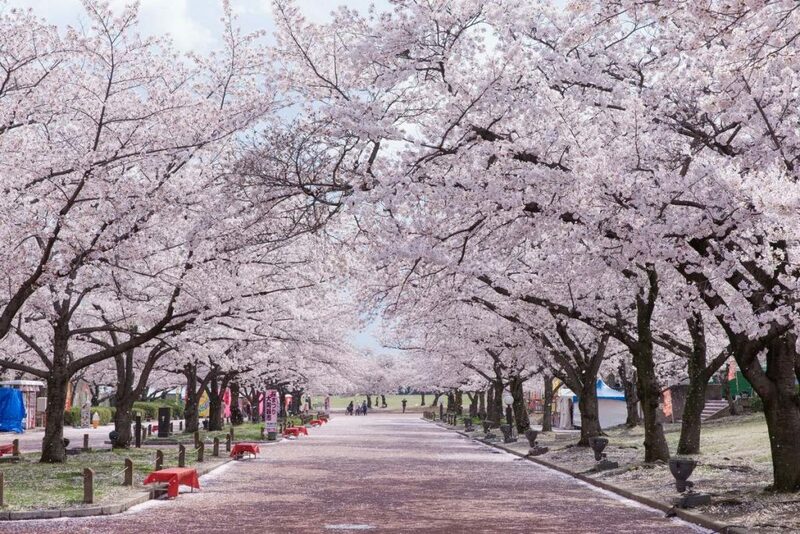 In the spring season, you can see more than 5,500 cherry trees in fool bloom at this park! It is also a favorite picnic place. 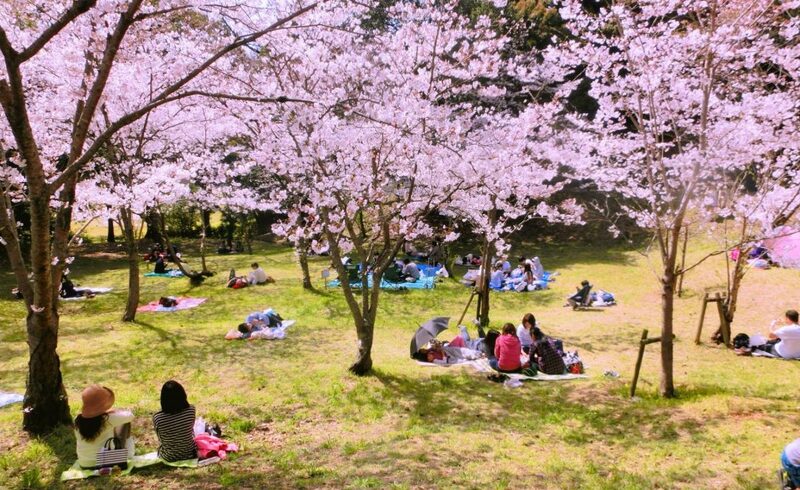 So, in spring, the park becomes lively with many people having a Hanami party with lunch boxes and soft alcohol beverages! When you visit here, how about having lunch with your family and friends? Yamanakadani Valley is also famous for cherry blossoms in Osaka. Besides, I highly recommend this place to the people who have an interest in trains. There is a beautiful cherry blossoms tunnel on the railway tracks near Yamanakadani station. 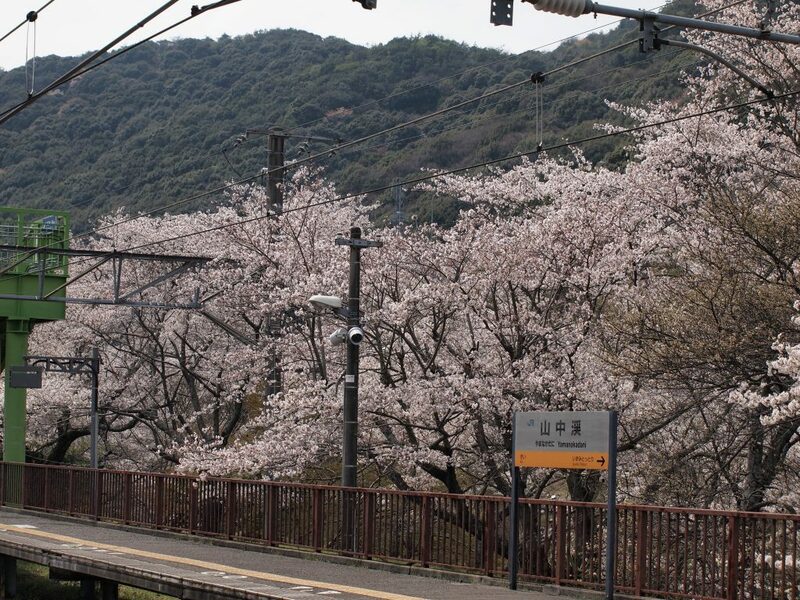 I am sure, you will enjoy seeing trains and the great view of cherry blossoms at the same time! Kishiwada Castle is not as popular if you compare it with Osaka Castle. So, if you want to avoid crowds but still want to see cherry blossoms, it would become a perfect spot! Enjoy seeing 170 cherry trees in full bloom around the castle! This castle is smaller than Osaka castle, but if you want to avoid the crowds and have a relaxing time, please visit here! Nara Park is the largest park in Nara Prefecture and is a famous tourist spot. It boasts a few world heritage sites, such as Todaiji Temple and Kasuga Shrine. In this park, you will see many deers and shops that sell deer snacks. This makes this park one of the most popular tourist attractions in Nara. 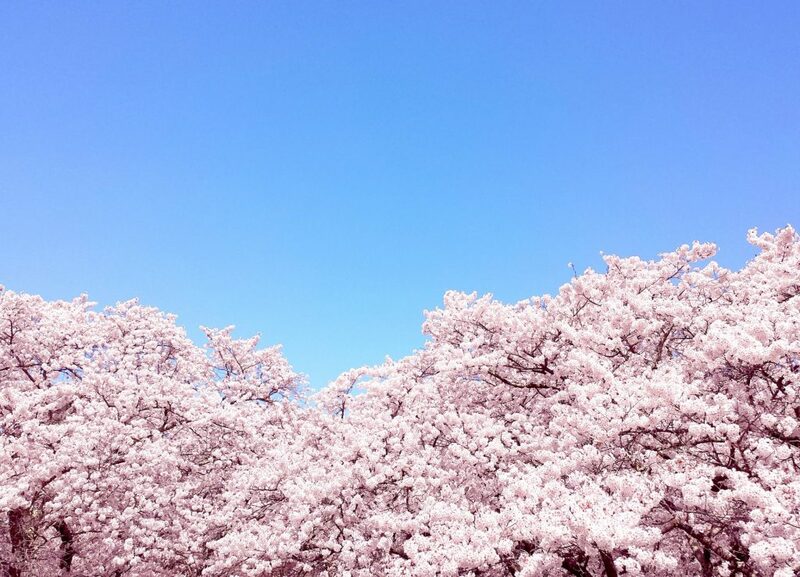 In spring, you must see the beautiful view of cherry blossoms. It is especially great to visit here at night when the cherry blossoms feature night illumination! If you want to know more about it, please check the article below. Almost all Japanese people know Ise Grad Shrine! 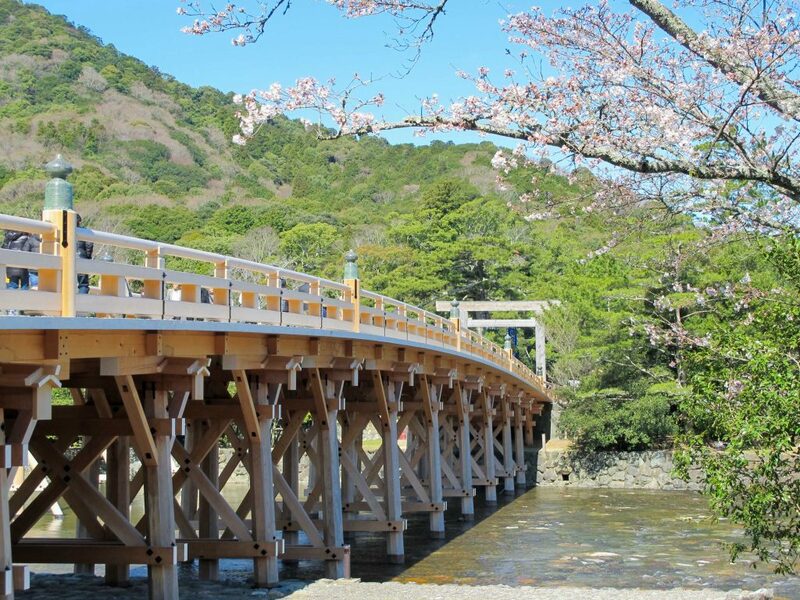 And when you visit this shrine, all people will cross the Uji bridge. 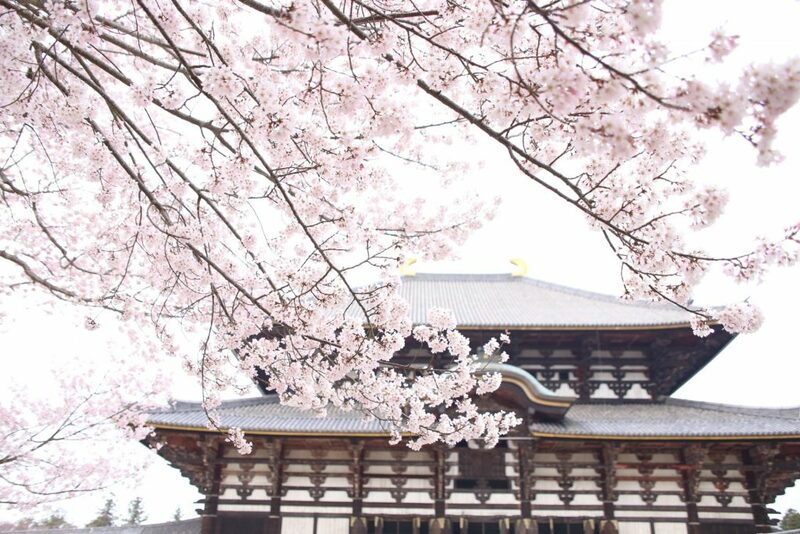 Of course, you can see cherry blossoms at Ise Grand Shrine. However, seeing Sakura from the Uji Bridge is the most exciting! 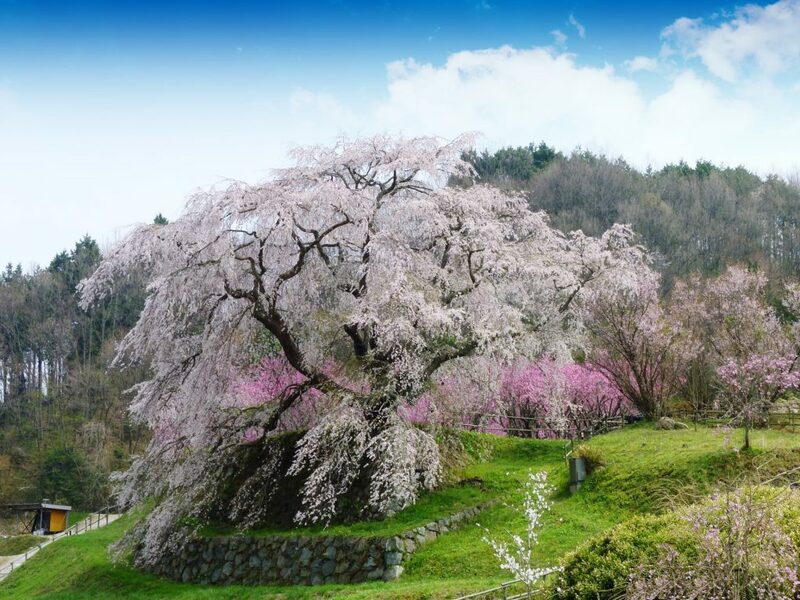 This spot is the best in Mie prefecture, and it on “100 beautiful cherry blossoms spots in Japan” list! If you want to avoid visiting big cities as Kyoto or Osaka, maybe it will be a good idea to visit Ise Grand Shrine! If you want to know more about it, please check the article below. There are many castles in Japan, but Hikone castle is one of the popular ones in Japan! Thus, it is a famous tourist spot in Shiga Prefecture that boasts its mesmerizing cherry blossoms scenery. 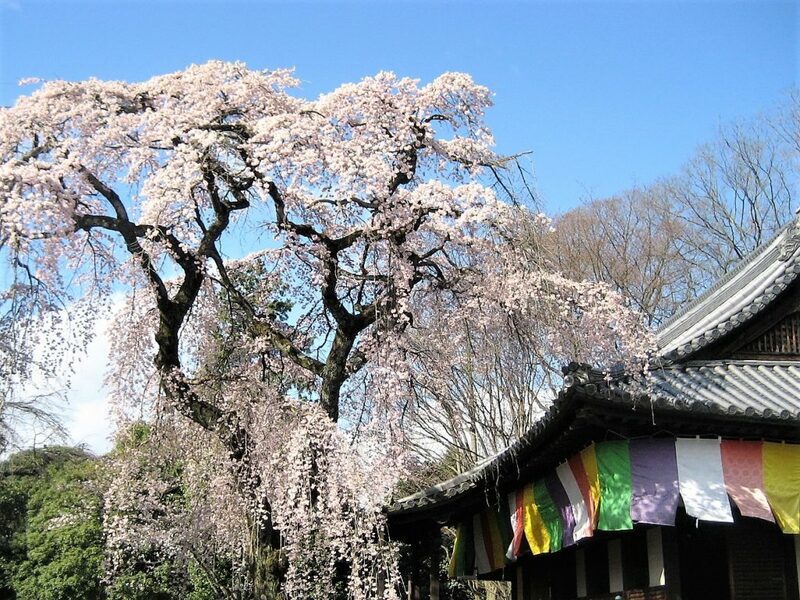 In spring, around 1200 cherry trees start blooming in the precincts of the castle. 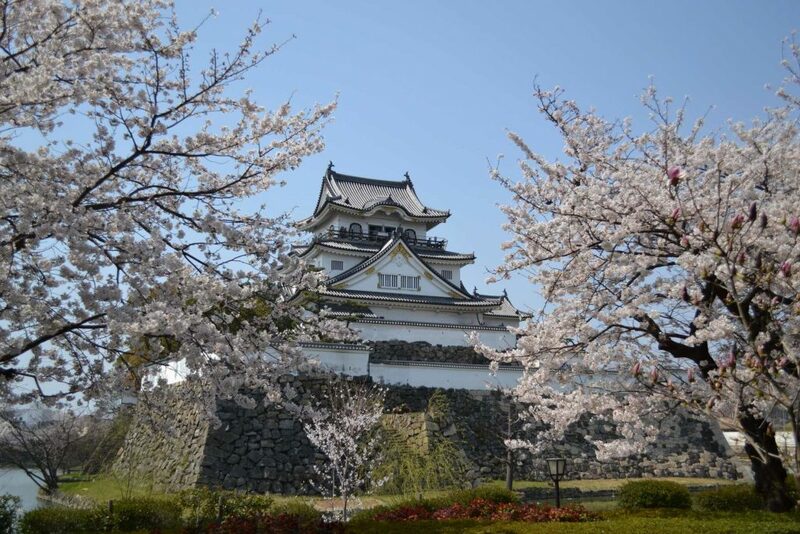 In Hikone castle, the cherry blossoms beautiful during the daytime. On the other hand, they change its look at night, and you will definitely enjoy them differently. The light up event lasts for a few hours during the festival starting from 6 pm and finishing at 9 pm. So, it will be great to visit during the festival which is between April 1st and 20th! If you want to know more about it, please check the article below. What is the Weather in Japan in Spring? When you travel to another country, you will probably worry about the weather there. For those people who want to learn about the weather in spring in Japan, I would like to explain it. Around March, there are mostly cold days, so you probably need a jacket to bring. The average temperature in the afternoon is around 13 degrees Celsius and 5 degrees Celsius during morning and night. In April, there are plenty of sunny days with a clear sky. The average temperature in the afternoon is around 23 degrees Celsius, and decrease to 15 degrees Celsius during morning and night. In May, during the afternoons it will be around 23 degrees Celsius, while in the evenings and mornings temperature decreases to 15 degrees. In Japan, spring is a perfect season to go outside because the weather is usually good. However, if you are planning to visit Japan at the end of May, you should bring an umbrella. In Japan, there is a season called “Tsuyu,” which means rainy season. It starts from the end of May to the beginning of June. What to Bring to Enjoy Hanami Party? The most important things you need to bring is something you can sit on. Most of the Japanese bring a big picnic sheet to sit with many people. Also, you need something to eat and drink, such as snacks, sandwiches, and alcohol. Plastic plates, forks, and cups are also useful as well. In Japan, most of the families bring lunch boxes and something to play (baseball, soccer ball) to enjoy Hanami. In Yoyogi Park, there is a store to buy balls and everything to enjoy in the park. Also, there is a huge field to play with your friends and children. It will become a great time for you for sure! Did you like reading this article? 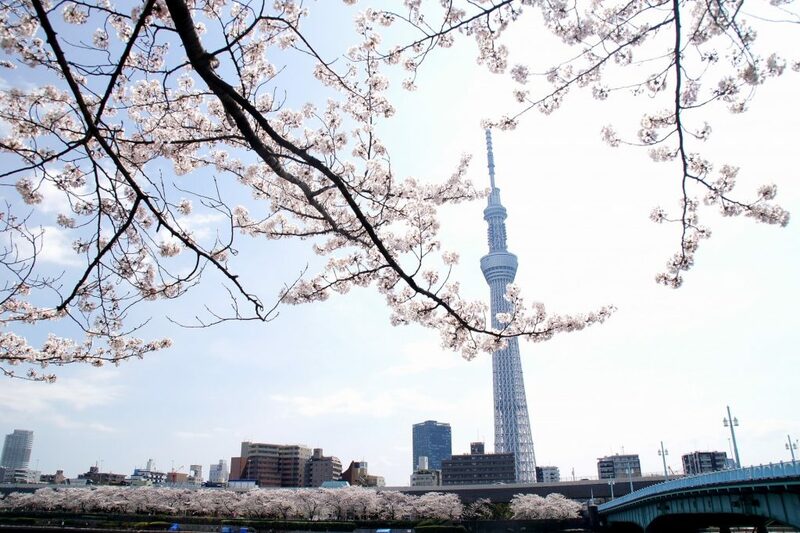 Did it make you want to visit Osaka and see cherry blossoms? In Japan, there are many spots for cherry blossoms so it might be hard to choose the one to visit. I hope this article helped you to make your travel plans easier! If you want to know more about Japan and want to visit these places with friendly local people, please check the banner below! An Ultimate Idea Source for Your Osaka Stay! Being the third largest city in the country, Osaka is one of the major gateways of Japan. Even if it is not the main place of your destination, it would be a great idea to stay in this great city for a few days. 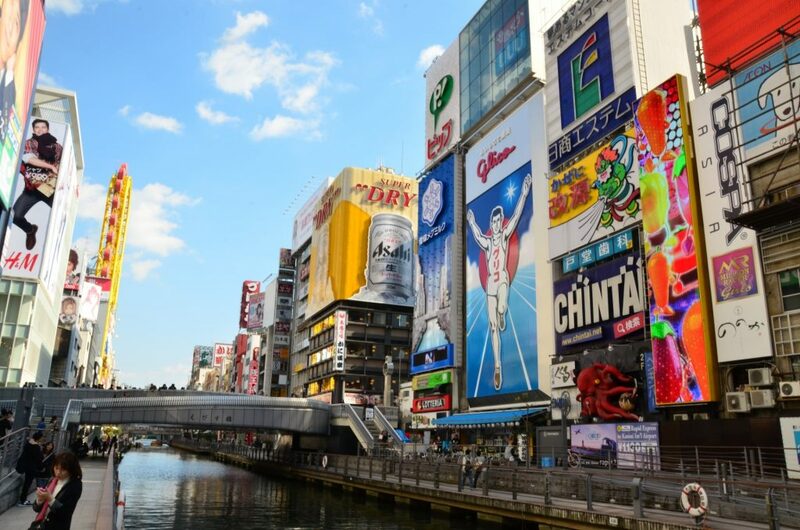 Whether you want to go sightseeing, shopping, eating out, or trying something special that you can experience only in Japan, Osaka has it all and even something extra. In the following article, you will find 100 things to do in Osaka and many ideas on how to spend your time in the city! 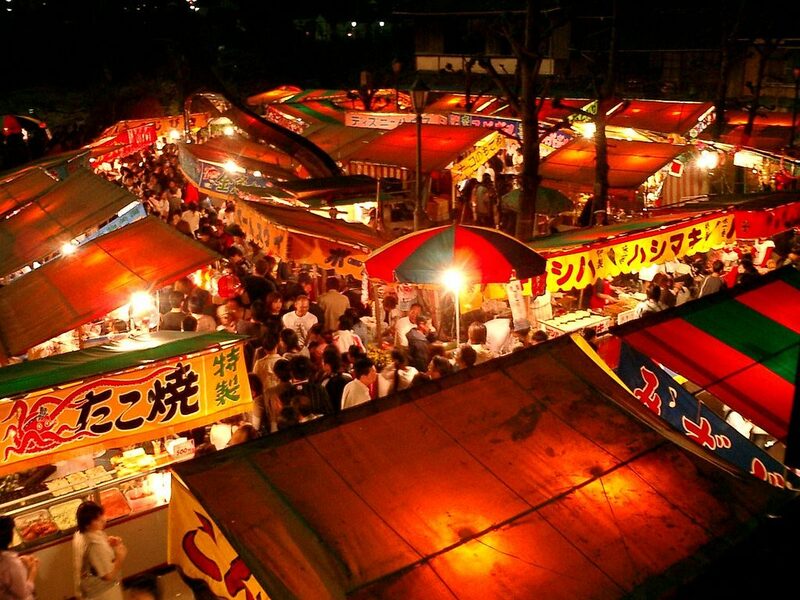 See More Osaka Spring Events and Festivals This Year! 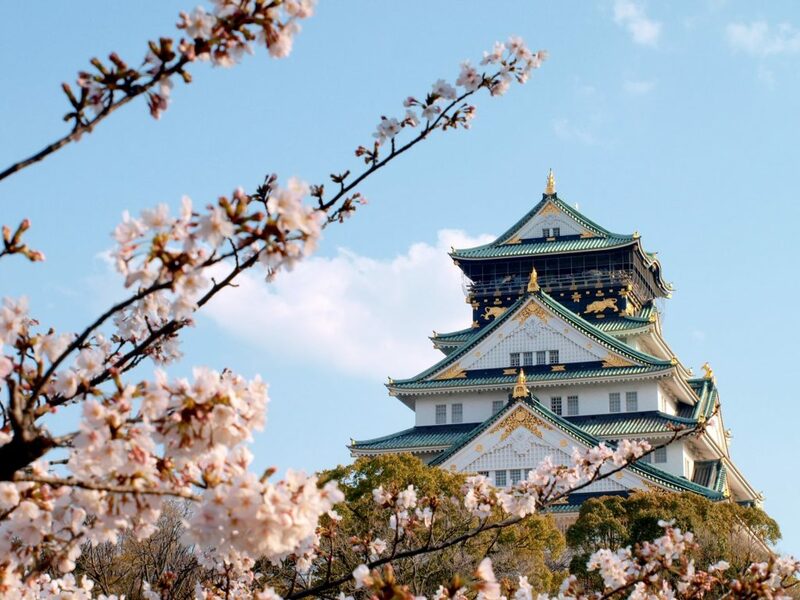 Are you planning on visiting Osaka this spring? 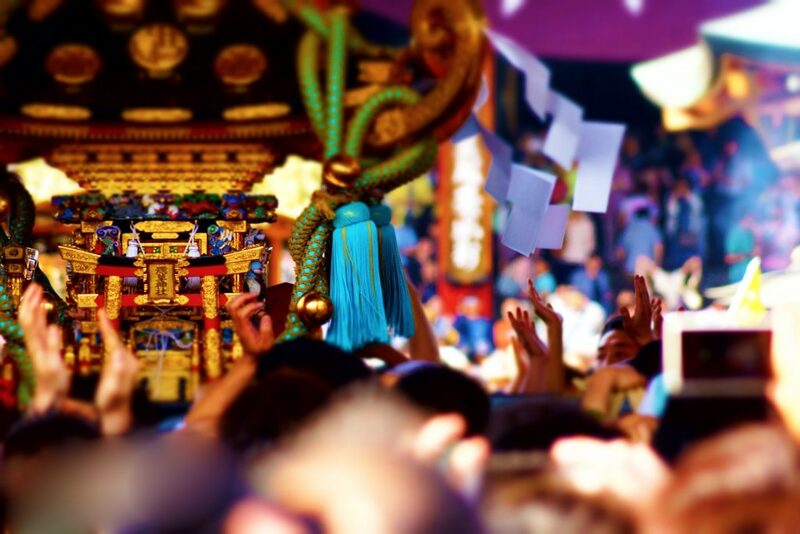 Would you like to see Osaka spring events and festivals this year? 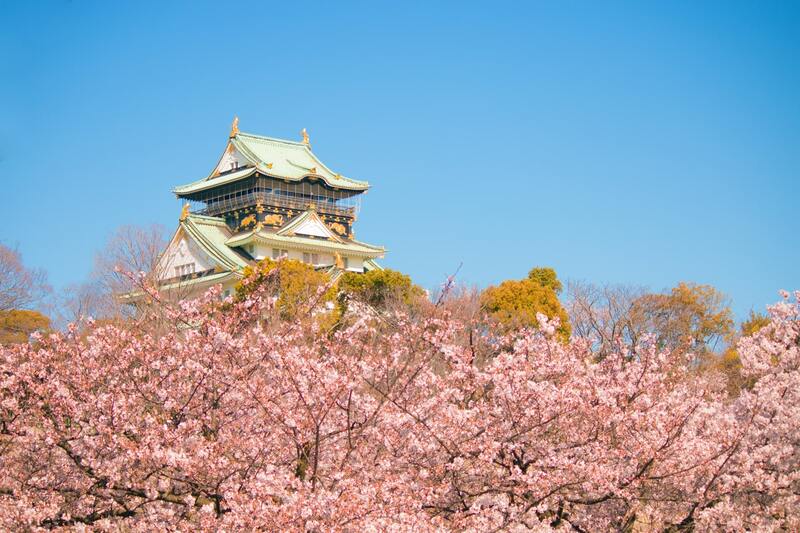 There are so many things to see and to do in Osaka including hanami (cherry blossom viewing), street festivals, and more! Osaka offers great food, great entertainments, friendly funny people, and a mix of historical and modern sites! The following article picked up the most popular spring events and festivals in Osaka this year! Please take a look! Kyoto has many beautiful spots to see Cherry blossoms. However, other areas also have excellent places for hanami. Tokyo features many of those spots as well! 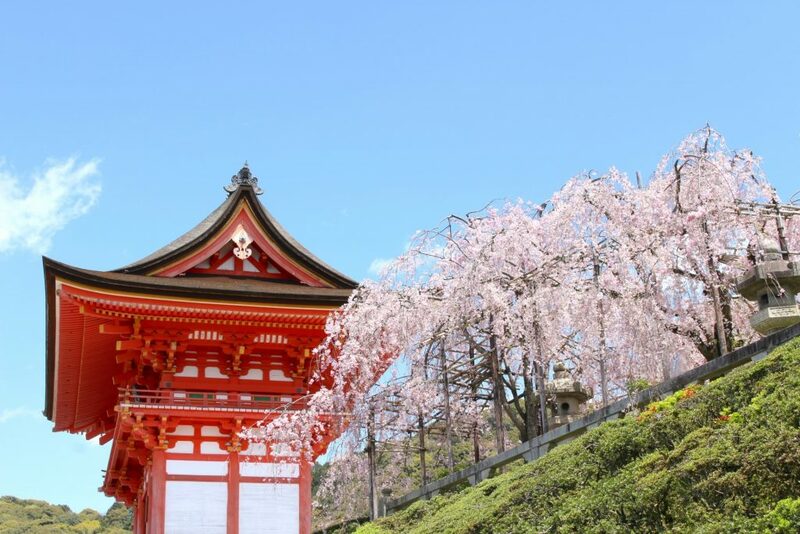 If you are in Tokyo around spring and looking for a place to see cherry blossoms, Why don’t you check the following article? 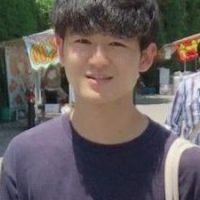 Hello, I am Masaki Nagamuma, college student in Tokyo. love to visit a lot of place in Japan and other country. If you have any interested in Japan, I want you to check my article.